65th Toronto Sea Scout meetings are Tuesday evenings from 7 to 9pm. There are also weekend events such as camps and excursions. 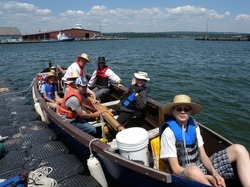 In addition, the Sea Scouts in the 65th Toronto have the advantage of being able to go on supervised sailing trips in United, the 65th's Montagu Whaler. United is a retired Royal Canadian Navy seaboat purchased in 2011 by two dedicated scouters for use by the 65th.